A driveway sinks and cracks when the ground underneath can't support it. 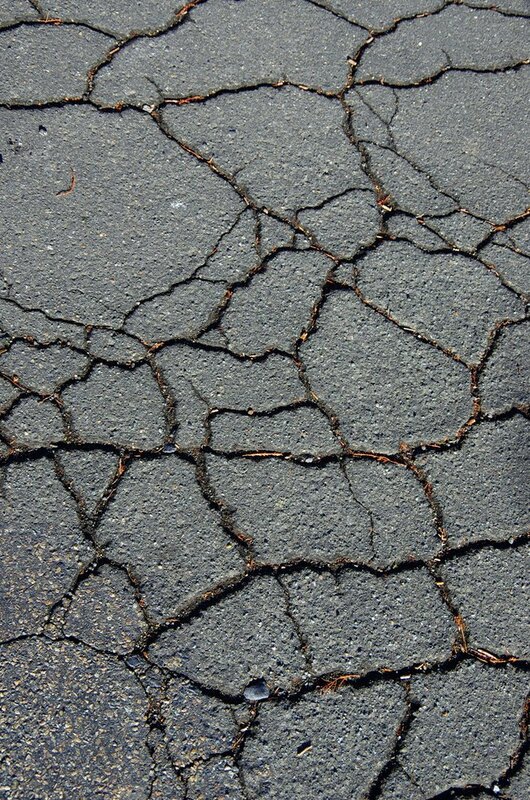 Some amount of cracking is to be expected during the life of a concrete slab. In fact, most slabs are constructed with control joints along which cracks are supposed to occur. An unusual amount of cracking spread over a large area isn't normal, however, and usually indicates that the slab is sinking. There are two main reasons for a slab to sink, and there are two repair options that don't involve grabbing a sledgehammer, demolishing your driveway and replacing it. That usually isn't the best idea, anyway, because it doesn't address the cause of the sinking, which has to do with the underlying soil. A new driveway will soon look just like the old one if you don't correct the soil settling problem first. Poor soil compaction and erosion are the two main reasons why slabs sink.. Preparing the ground to support a slab that forms a driveway, patio or walkway is an essential step during slab installation. This usually involves compacting the soil with a plate compactor, but this compaction may not extend more than two feet or so below the surface. Deeper soil may continue to settle after compaction and installation of the slab, especially if it is loose and loamy. This is especially common on building sites that have been leveled and filled to create easy space for building, because the fill material used is rarely compacted to the degree necessary. There's little you can do about this short of digging out a significant amount of the soil and replacing it with heavier material. Soil erosion caused by poor drainage is another common cause of slab problems. 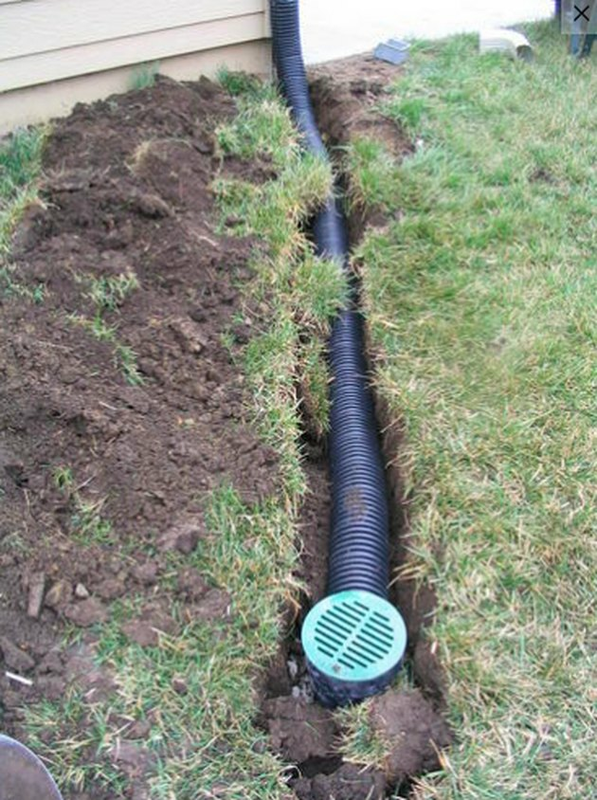 Unlike deep settling, drainage problems can be rather easily corrected once you've identified them. The symptoms are easy to spot. Look for standing water or voids in the soil around the edges of the slab, which indicate the likely presence of voids beneath it. You will have to fill these voids after addressing the drainage issue, or the slab will continue to sink. You can always tear up the slab and add more dirt, and this may be the best strategy if the slab is seriously cracked. If the slab is more or less intact, however, you can often fill these voids by injecting material through pre-drilled holes in the concrete. This process can also raise the slab back to its original position. Mud Jacking requires professional high-pressure equipment. 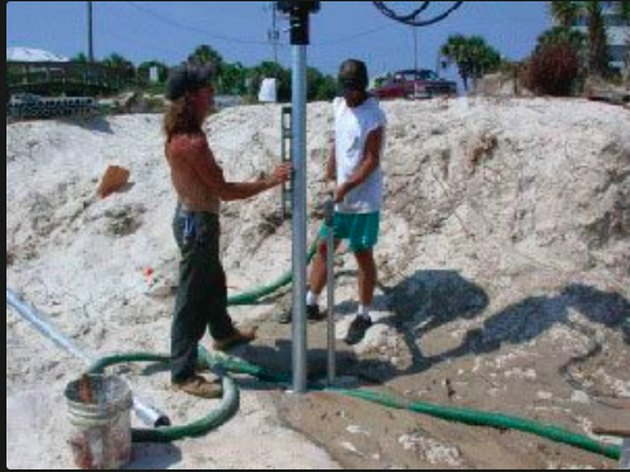 The least expensive way to raise a sunken slab is to inject a combination of dirt, aggregate and Portland cement through holes in the surface. This process is called mud jacking, and it's a job best left to pros with the equipment to do it, because the material has to be injected under pressure to do the job. Mud jacking can cost anywhere from $300 to $2,200, depending on the size of the slab, but most homeowners end up paying around $900. Mud jacking is not without drawbacks. 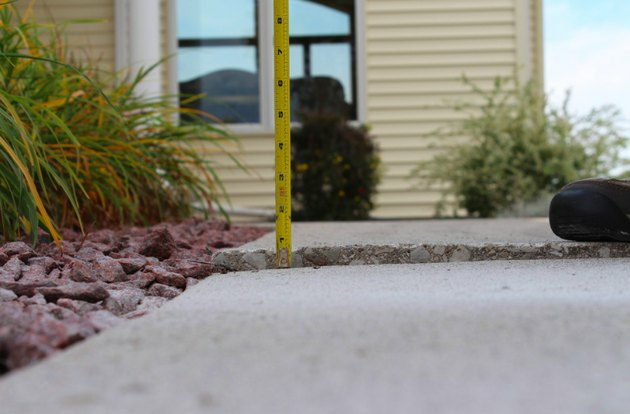 The holes you need to cut in the concrete are around 2 inches in diameter, which can be difficult to hide. Moreover, the material you inject through the holes adds weight to the slab, which could cause loose soil to compress even more than it already has. Finally, the material is still vulnerable to erosion damage and may wash away if a drainage problem recurs. 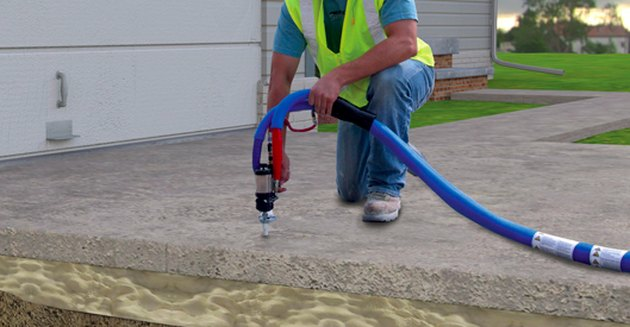 Foam injection is a solution similar to mud jacking, but instead of dirt and cement, you force polyurethane foam under the slab. The foam is a two-part product, and when you combine the parts, it quickly expands and solidifies, creating enough upward pressure in the process to level the slab. The foam adds very little weight to the slab, so it won't cause the soil to compact any more than it already has. You need to drill fewer holes in the driveway, and they are only 5/8 inches in diameter, which makes them easier to conceal. 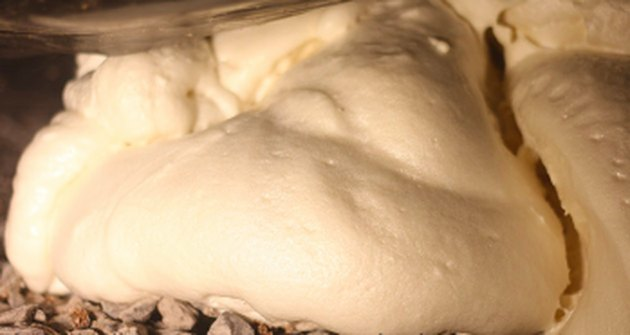 The foam is a liquid when you inject it, so it flows into voids and fills them more completely. The foam sets more quickly than the slurry used for mud jacking, and once it solidifies, it won't wash away. On slopes or in poorly draining soil, the best solution might be to attach the slab to piles. You can also stabilize a sinking slab by driving helical piles into the ground around the affected area and securing the slab to those. This is a technique that's more useful for building foundations and retaining walls than for slabs, but it may be the best strategy for a driveway on a steep slope, one located next to an eroding hillside, or one situated on very loose soil. In this process, the piles—long metal poles— are driven into the ground with heavy equipment, then the slab is lifted mechanically and affixed to the piles. This is obviously a job for professionals and one you would undertake only if consultation with pros determines that the situation warrants it. Take care of drainage problems before re-leveling a sunken slab. If you can find a place to rent mud jacking equipment, there's no law preventing you from doing the job yourself. You'll need to pre-mix a solution of fly ash, sand, Portland cement and an additive to prevent the mixture from shrinking. The procedure involves drilling 2-inch holes in the concrete, injecting the mixture and patching the holes with fresh concrete when you're done. You can also inject foam yourself, but again you'll need to find a place to rent the equipment. However, just because you can attempt this doesn't mean you should. Mud-jacking or foam injection is no easy task, and you may end up hiring a pro to do the job right after botching your DIY attempt. If you're having a problem with only one smallish section of the driveway, you may prefer to break up and remove the part that is sinking, using a sledgehammer or jackhammer. You can then add material as needed and pour new concrete to replace the section you removed. Other than a concrete mixer and perhaps a power jackhammer, you won't have to rent any equipment to do this job, which requires only basic concrete skills. Before making any repairs, it's essential to take care of drainage problems, or your work will be in vain. The fix may be as simple as redirecting the water coming from the downspouts, but if you have high groundwater or persistent runoff from a slope, it's best to consult with a landscaper to determine the best remedy.